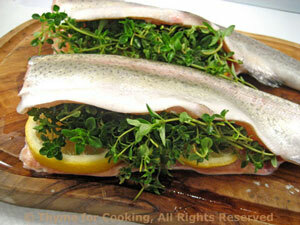 Grilled Trout stuffed with Lemon and Thyme, Thyme for Cooking summer recipes. If you have a basket for the fish it will hold them together nicely. If not, tie them with kitchen string. Put lemon slices and thyme inside the fish - as much as you can stuff in. Either put fish in grill basket or tie securely and use a grill mat. Cook on barbecue grill over medium heat about 7 minutes per side or until done, turning once. Can also be baked or cooked under the broiler. Times will vary according to the size and thickness of the fish. When done the flesh should be opaque. Note: I skinned each fish and took out the back bone, lemons and thyme before serving but it also makes a nice presentation served whole.